Ask nearly anyone who plays in a band for more than casual fun about their preferences for gear and odds are the answers that will come will be as varied and enthusiastic as the music that person plays. Heck, just read some of the interviews here, it’s a bag of unpredictable fun to ask musicians what their favorite tool of the trade is! Even with nearly endless possibilities in mind and all the gear love in the world, it’s probably not too far of a reach to presume that if musicians could retain sonic variety and effect diversity within their setups, minus the weight and cumbersome nature that accompanies pounds upon pounds of amps, pedals, wires, and other equipment, such an option would be a popular one, right? The answer to that question remains to be seen but, for the moment, a soon-to-arrive new piece of hardware called the JamStack, might just be taking guitarists and bassists in that direction. In a few words, the JamStack positions itself as the “The World’s First Attachable Guitar Amp.” Conceived by Chris Prendergast, a guitarist with the knowledge and insight of an electrical engineer, this tool is striving to bring the electric guitar and bass out of the house and into the world of anytime, any place possibilities. While it might seem like a farfetched idea yet to be discerned into a practical and usable form, the project already surpassed the need for Kickstarter and is in the process of a first run of manufacturing. The tech gets its capability via teaming up with a user’s smartphone of choice and unlike miniature amplifiers, the sound generated by the JamStack avoids creating a distorted tone, even if it’s set to a lower volume of playback. 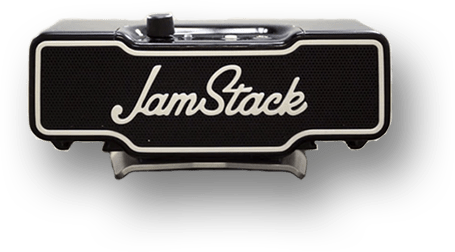 Perhaps the most versatile aspect of the JamStack however, beyond its hybrid of power and size, is its ability to combine ease of movement, electrical amplification and the versatility of smartphone effect apps (e.g. AmpKit and AmpliTube). The attachment can integrate layering and effects with the straight amplified sound, making its use extend past that of just a key to more electrical portability. Hear Prendergast explain his vision for the JamStack in the video below and then check out the JamStack in action. Now, this being the first iteration of a new kind of tech, room for improvement is to be expected. That said, from a conceptual standpoint, the JamStack is certainly on to an appealing ideal. How much realistic range this or future versions of the little amp will have as far as active playing scenarios go, isn’t a certainty yet. While considering more streamlined changes to the gear in the future, it still generally seems to be something inherently better suited to impromptu and-or casual playing, as opposed to a proper show, where space for full equipment would be available. That said, for space and electrical outlet-limited performance arrangements like that of the mostly acoustic Sofar Sounds, JamStack’s removal of the cord element would make it a great asset in that environment. Running price is currently projected at $148.00 USD and first shipments are projected to go out in August.